Pope Benedict XVI Meets the Press Recognizing the global impact of the media, Pope Benedict XVI becomes the first pontiff to hold a news conference. In a 15-minute gathering, he thanked the press for coverage of Pope John Paul II's death and the conclave which elected Benedict as John Paul's successor. Recognizing the global impact of the media, Pope Benedict XVI becomes the first pontiff to hold a news conference. 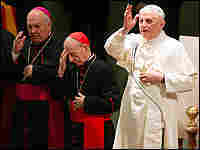 In a 15-minute gathering, he thanked the press for coverage of Pope John Paul II's death and the conclave which elected Benedict as John Paul's successor.